A while ago, I mentioned that all cricket games are crap because all cricket games have crap controls. I am happy to say that I have been proven wrong, albeit in two dimensions, and without any attempt at simulation. 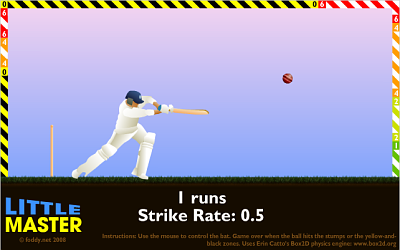 The Little Master cricket game is a really basic but addictive gem of a game. From a very non-traditional side-on position, the mouse controls little more than the hands and balance. This is sufficient, however, to allow you to drive or defend off front or back foot, by pushing at the ball - much as in real life. More to the point, it makes playing shots closer to real life. Timing matters, but it is not essential; the shot is stroked, not hit; the play is meditative, not violent (though you can be violent). It feels like batting (or at least throw-downs) in a way that nothing else even attempts. It occurs to me too, that I continue to over-complicate the batting in the theoretical game cited earlier. With some (substantial) tweaking to convert from 2d to 3d, there is an elegant mouse-only approach. The key is the realisation that the stroke and movement are separate but confluent. As the ball is bowled, the player should be moving the hands and weight into position. This can be modelled with a curved plane. The thick red line represents the position of the hands, the blue the field of vision (from behind the stumps) and the thin red the field of movement. Moving left or right (not seen in the picture) will adjust for line. Moving towards the ball will advance down the pitch, either a little, or a lot (marked by the top-most line). Moving down the screen will play back, with a raising of the hands and adjustment upwards as you move further backwards (represented in the curve of the thick red line). With movement and weight distribution covered, that leaves the slightly more confusing problem of stroke-play. A stroke is made up of two parts: the act of swinging the bat through at some angle; and the movement of the hands in relation to the ball, to guide, glance, push, defend, etc. The first part is therefore represented by a cone of swing. Regardless of hand position, the length of time spent holding the button, represents the power of the stroke, from a defensive tap or glide, to a full follow-through. By dragging the mouse in some direction, the bat will move through the cone in the direction of push. For a front foot shot, pushing forward with the mouse would swing through the line of the ball. Left and right would cut and pull. Back, would reverse the hands, resulting in a tennis shot, or paddle. For a back foot shot, pulling back will hook, forward, a back foot punch, left and right the cut and pull. These controls seem intuitive with a little practice, but back to front in terms of where the bat travels in relation to the mouse movement. The second aspect, the hand movement, is straight forward. Releasing the mouse button will continue the shot being played (whether short or long), allowing the player to press early and wait on the ball. Moving the mouse after the shot will complete the final aspect of control: dropping or raising the hands (down or up), and gliding, pushing and directing the ball (left or right). Seems simple. The only thing missing is a reverse sweep, though that could be accommodated by pre-emptively playing a pull shot to "reverse" the hands. The ICC is a much criticised organisation, but in at least one area they've been doing quite well. The game at associate level goes from strength to strength. The recent qualifiers attracted widespread coverage - albeit mostly focused on Afghanistan - and by all reports, the standard of play and competition is improving rapidly in the various leagues and ICC tournaments, such as the Intercontinental Cup. Players from that level are now regulars on the county circuit, gaining recognition for their skills. And therein lies the tragedy. There is only one true path to greatness in sport, and that is to prove yourself against the best. In cricket, that means playing test cricket. No other level matches the intensity and skill level; no other form of the game embodies the values sought in a cricketer. Many sports have forgotten greats, players who couldn't beat the path to greatness for one reason or another, but none have so many, nor do any have such an institutionalised aversion to providing a path as cricket. Being a national of a minnow is, of course, a barrier to success, but only in cricket is it also a barrier to playing the game. And so, for all the good work of the ICC, the abilities of very good players go unrewarded, and worse, the abilities of great players are lent to others. The barrier is test status. It is argued, perhaps validly, that associate nations are not of test standard. But what is "test standard". Is the rubbish being served up by the West Indies "test standard". On the recent form of Bangladesh, Zimbabwe and New Zealand, only six teams could claim they are clearly above those below them. Test status is more than just a standard in any case, based on reasons statistical, logistical and political. Statistical, because it implies a debasing of averages, if one must compare players dominating lowly sides, with those limited to (mostly) good teams. But such a debasing has already occurred, Bangladesh and Zimbabwe are routinely excised from averages; statisticians are capable of making adjustments, if one wishes to make a true judgement of worth. Statistical integrity is hardly, by itself, a good reason for constraining the growth and future well being of the game. The problem of logistics is more cumbersome. It has been policy to play all nations, and the removal of Zimbabwe was at least partly motivated by the need to reduce the burden of endless (and often heavily mismatched) two-test series. Clearly however, other sports handle this burden. Teams play qualifiers against good and bad sides, before reaching higher levels, or groups are formed then modified via relegation and promotion. It is not, by itself, a difficult proposition. The real reasons lie in politics. The ICC is not a multi-member lobbyists dream like FIFA, it is a balanced group of voting blocs, shifting alliances according to finances, region and racial affiliation. To open up this group to others, particularly members rife with their own disfunctions (the USA stands out in this regard) is to invite chaos. Yet again, these problems can be solved. The UN has always been dominated by its superpowers, and cricket could easily express its voting power through the institution of "permanent members". The exclusion hurts cricket however, in myriad ways. Firstly, the players who miss their chance. David Houghton may well have been a true great, but we can only compare his tentative first entry into test cricket, at an age when most have retired. Steve Tikolo could have been much more than one of the best batsmen of associate cricket, but his time too, has passed, as have those of his talented team-mates. Others choose to fly other colours, hurting those players they displace, and their own associate careers should they fail as Gavin Hamilton did, and Ed Joyce might. This has a knock-on effect to their home countries. Did the absence of Graeme Hick make the transition to test cricket easier for Zimbabwe? Was Ireland's performance in the 2007 World Cup better for having their best batsman playing in the opposition? As Tim Brooks explains, it would be churlish to think ill of Ed Joyce, Amjad Khan or Ragheb Aba for choosing to further their careers away from their home countries. However, as the list of players expands it has or could include talents like Eoin Morgan, Ryan Ten Doeschate, Alexie Kervezee, William Porterfield or Boyd Rankin. How are we to judge the quality of associate cricket if associate cricketers don't and can't play associate cricket? The long term effect of this diaspora is unknown, but it can't be good for the growth of the game in those places to see quality players represent other countries on the world stage, and it is certainly not good for decent teams to be devoid of representation at all. The golden era of Kenyan cricket, marked by a (lucky, but deserved) semi-final appearance at the World Cup in 2003 is passing. The legacy may well be nought. Current development, to the extent that it supports an expansion of the cricket world, rests on two assumptions, both increasingly false. The first is that players will reach their peaks playing for their national side, in international competition. But as we can see from the players above, other emerging associate cricketers, and with comparison to other sports, the top level of sport for players from weak nations is generally the club setups in strong nations. Whereas in the past test nations have been able to (almost exclusively) draw their strength from their local competitions, in the future, any nation could conceivably draw on experienced players from first class cricket and the 20/20 leagues. Much as the Irish football side has no player plying their trade at home, the Irish cricket side will draw strength from the county game. Provided, of course, that the county teams, and English poaching of players doesn't actively prevent that development from taking place. The second assumption is that there is a path to be trodden, from dominant associate team, to test whipping boy, to respectability. What we have seen recently though, again parallelling other sports, is that weak teams will have phases of good and bad. A handful of sides will always be competitive (Australia, South Africa, England, India, Pakistan, and maybe Sri Lanka and eventually Bangladesh). But places with limited playing bases will depend on greatness to lift them from mediocre to good, and greatness involves luck. Under the current assumption, test status is a right, gifted at a certain level. In a realistic universe, teams will change from good to bad and back again, moving upwards to better competition when they do well, and downwards when not. In a fairer and better world it would be Ireland hosting the West Indies this summer, not England. As numerous commentators have noted, Eoin Morgan is rather good, as is the unlucky Ed Joyce. Tack in Porterfield and the O'Brien's and they can match, if not exceed the batting lineups of the West Indies, New Zealand, Zimbabwe or Bangladesh. But you won't see Ireland play any test sides over five days, nor, unless the daft law requiring a four year wait to change back to associate level is rescinded, will you see anything like a full strength Irish side. Test cricket, in other words, will remain the preserve of an elite group, and a sub-elite but historically fortunate second tier. Very good and potentially great players will have to change allegiances to prove their worth, and good players will remain unfulfilled at a national level, though they may succeed with honour in the first class arena. The dream of stepping out onto a field against a respected side, as equals in a test match, and beating them - as Australia once did, over 100 years ago, to the consternation of equally conservative English authorities, and as several worthy teams have done since - will remain unattainable. The West Indies have been semi-competitive at home and abysmal travellers for some time now. The funny thing is, it only just occurred to me why that is, and why they seem to be in such an irretrieval funk. They don't actually like playing cricket that much. I've been where Gayle is: asked to captain a side when I was the senior player, rather than through burning hunger for the job. It isn't fun, so I'm sympathetic to his comments. We all point at the West Indies and say they are unprofessional, casual, disinterested. That they don't like the grind of modern cricket and prefer home games, or 20/20s. But what hasn't been recognised is the root cause. The West Indies talent pool is shallow. For a long time great talent hid that, but of late, for whatever reason it has reverted to what you'd expect for a poor community of 3 or so million people. If you want to play test cricket for Australia, or England, in the modern game, you need to live cricket, you need to want to play it all day, tour constantly and train religiously and effortlessly. It is your job, you are a professional. If you aren't, you won't make it. But to play test cricket for the West Indies, you don't need to do those things, you just need a bit of talent above and beyond your peers. So you can become a professional, but not be a professional. You can spend your days wishing you weren't suffering in the cold in northern England, and still take the money. And there isn't much the WICB can do about it. It is sad, but it is also a symptom of modern cricket. The best national sides have professionalised, built academies, career paths, lifestyles. When the West Indies ruled the world, it was an honour to play for your country, not a job. They were driven because they wanted to prove something, and they competed irregularly against semi-professionals like themselves. I am sure the West Indies still has enough cricketers to fill a squad with talent, but I am not sure it has enough cricketers to fill a squad with talent who want to devote their lives to cricket. The teams with small player bases have therefore been left behind, in skills, in drive, in results. And that is where the worries in cricket are coming from. Other sports don't manage to maintain 12 months a year national competition, because national competitions are inherently uneven. We didn't know it at the time, but constant touring and high salaries beget professionalism, and the pool of potential professional cricketers is too big for national competition. The future of cricket is not necessarily 20/20, but it probably is club cricket. As any follower of associate cricket can see, the talent pool is expanding, and as any follower of test cricket can see, the competition is become less even. Cricket is growing, but it needs to grow through the club. Too many national sides just won't reach the required level.